The disappearance of the Belarusian language from the public space, a visa free campaign, the commemoration of Vitali Silitski and summer schools feature among the top civil society news this week. Belarusians can learn more about their history in the 1990s thank to the new project ‘90s.by’, European Café held a public lecture on the European Union, and will the protestant church ‘New Life’ face accusations of the illegal use of a building for a prayer? All this and more in this edition of the Belarus Civil Society Digest. Samakhod 2013. The campaign "Visa Free!" presents the second Festival of mobility "Samakhod" (Self-Propelled) which is to be held in Minsk on June 21-22. The Festival will be opened with a concert of groups Akute and Clover Club and be continued at the creative cluster ME100. The second day of the event's agenda includes workshops, lectures, and performances. The Festival's topic is human mobility. Participation in all events is free. Silitski is remembered. On 11 June two years ago Vitali Silitski, a prominent Belarusian political scientist, and the first BISS director, passed away. Silitski became well-known in the international scientific community with his concepts of preventive authoritarianism and authoritarian international. This year Silitski's colleagues and friends gathered for an evening of remembrance in Minsk. Nash Dom initiates an amendment to the Law on the status of deputies. Activists of the civic campaign Nash Dom appealed to the Committee on Regional Policy and Local Self-Government of the Belarus National Assembly regarding the amendment to the Law "On the Status of Local Councils' Deputies." Nash Dom offers to reduce by more than three times the number of voters in districts at the written request of which can be heard by an extraordinary report of a local deputy. Where did the beauty go? Digital-studio «Aguru» launched a non-profit social project admova.by, dedicated to the issue of the disappearance of the Belarusian language. The first video under the project caused, though, the most controversial reaction in Bynet this week. Culture improves life. The campaign Budzma! released another video in the frame of its concept "Culture Improves Life." The video presents a number of talented individuals who answer the question "why?" with projections for their profession – including the writer Uladzimir Arlou, editor of the Belarusian Wikipedia Pavel Selitskas, lawyer Darya Katkouskaya, athlete Vitaly Gurkou, etc. "Chronicle of Judgement Time" presented at BAJ website. The series of mini-movies "Chronicle of Judgment Time" includes eight films that are dedicated to the members of Belarusian Association of Journalists who suffered in the name of freedom of speech: Ales Bialiatski, Zmitser Bandarenka, Iryna Khalip, Andrei Pachobut, Natallia Radzina, Pavel Seviarynets, Anton Surapin and Siarhei Vazniak. The project originated with the informational support of the Human Rights Center Viasna. 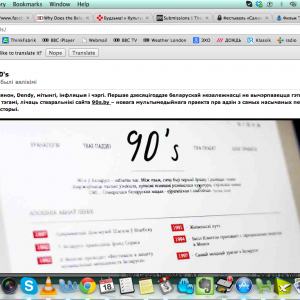 Back to 90's. The new multimedia project 90s.by shares the most intense period of Belarusian history – the decade stretching from 1990 to 1999. The project authors are ambitious and willing to cover everything: from elections and crises to rock festivals and the first "McDonald's." Each article will contain interviews with direct participants, fragments of memories, statistics and interesting facts, archival photos and videos, and related links. Among the goals of the web site is to inspire people, because in the 1990s Belarusians were acting on the principle of "if you want something – do it." CES environmental videos. Center for Environmental Solutions created a series of videos, called "Collect old batteries separately". The videos are dedicated to World Environment Day and tell why it is important to dispose of used batteries in special urns and what danger these wastes bring to health and the environment. The videos are created with the support of the Ministry of Natural Resources and Environmental Protection and planned to be broadcast on national TV. 15 thousand signatures in support of Belarusian wetlands. 15,000 Belarusians provided their signatures against the extraction of peat in the partial reserves which were forwarded to the Council of Ministers, the Ministry of Natural Resources, the Minsk Regional Executive Committee on 5 June. The coordinators of the campaign "In Defence of Wetlands" note that the signatures were collected less than planned. Minsk hosts conference on Belarus-EU partnership. The Institute of Philosophy of the National Academy of Sciences of Belarus under the auspices of the MFA of Belarus and the EU Office in Belarus host to an international conference “Belarus-European Union: Problems and Partnership Prospects” on June 13-14. The program of the conference comprises reports and greeting speeches on behalf of the MFA, the EU Office and foreign diplomatic missions. European lecture in café. On 18 June a public lecture "Modernization of the New Strategy in Eastern Europe: the Impasses and Leapfrogging" took place at a Minsk cafe. The lecturer was Dr. Pal Tamás, a professor of Corvinus University (Budapest, Hungary). The lecture was held in the framework of the project "European Café: Open Space of Europe" implemented by the Centre for European Studies. NP conference in Minsk. On 1 June the National Platform conference titled “Between the Eastern Partnership and the European Dialog on Modernization” was held in Minsk. The conference resulted in the election of a new Coordination Committee and its chairperson – Ulad Vialichka, supported by 37 out of 44 representatives of the organisations attended. 26 Belarusian organisations were recommended for the 5th meeting of the Civil Society Forum out of 33 applicants – a marked decline of 300% when compared to the previous Forum. Workshop for school teachers. Belarusian School Society and the web site Nastaunik.info invite educators, librarians and teachers to participate in the workshop "The School as a Platform for the Formation of Social and Civic Competencies". The seminar will be held on 22-24 June near Minsk; organisers cover all related costs. Summer historical school. From June to August, the Skaryna Language Society under the campaign "Budzma" starts summer school of history "History on Vacation" held by Dr Aleh Trusau. The participants will have an opportunity to see and discuss historical films and take part in a historical quiz. The School is free. Closed hearings on "espionage case". On 12 June the hearings on the case of Andrei Haidukou, 23-year-old Navapolatsk resident, who is accused of "high treason", started at the Vitsebsk Regional Court. No one, including journalists and human rights defenders, were allowed to attend the hearings. Andrei Haidukou was arrested in November in Minsk "while he was hiding with information which could be relevant to foreign intelligence services". Economic Court again against “New Life”. On 13 June church "New Life" received a summons from the Minsk Economic Court for the initiation of proceedings against the church. The document offered the church community to leave the building it occupies in 7 days. But the next day, on 14 June the authorities informed the church that they had suspended the proceedings. Journalist warned for work with Belsat. The prosecutor’s office of Smaliavichy district issued a warning to an independent journalist Ales’ Silich for contributing to a foreign mass media service without accreditation. On 9 June Belarusian state television reported the launch of the Journal of Belarusian Studies in London. It appears that even the Belarusian state TV channel, usually silent about such initiatives, appreciated the importance of the event – the oldest academic journal on Belarus making its return after a 25 year break. Published by the Centre for Transition Studies and the Anglo-Belarusian Society, the Journal remains faithful to the original mission to promote Belarusian studies in the West. But unlike in the past, the revived Journal will come out in two languages: Belarusian and English to serve as a bridge between Belarusian and Western scholars. The Journal builds on a long tradition. Fr Alexander Nadson, one of the founders of the Journal and the librarian of Francis Skaryna Belarusian Library in London, explained to Belarus Digest that back in 1950s they wanted to promote Belarusian culture in the United Kingdom. Fr Nadson underlines that these were primarily British people who pushed the whole project forward. Among them was Lord Auberon Herbert and Anglo-French lawyer Guy Picarda, who both took an active role in publishing the Journal. Already in 1960s the Anglo-Belarusian Society began organising public lectures about Belarus in London. Guy Picarda came up with the idea of publishing a journal which would cover Belarus from different academic angles. In 1965 the first issue of the Journal came out. Professor Robert Auty from Oxford University wrote in the introduction that its mission was to be "a source of information for non-specialist readers about a little-known East European people and its contribution to civilisation". Although Belarus did not exist as an independent state between 1965 and 1988 the Journal of Byelorussian Studies, as it was known in the past, presented Belarusian culture and history to the English-language readership. On 21 May 2013 those who were involved with the journal in the past and with its resurrection gathered for a formal launch at the UCL School of Slavonic and East European Studies – one of the world's leading specialist institutions for the study of Central and Eastern Europe. The panel included Fr Alexandr Nadson, Professor Arnold McMillin and the Journal's editor Dr Yaraslau Kryvoi. The panellists recalled the history of the Journal and that the renewed Journal aims to cover a broad spectrum of disciplines such as Belarusian culture, history for the Western readership. According to Yaraslau Kryvoi the new vision of Journal also includes an ambition to become a platform for Belarusian and Western academics to share their ideas. In addition to academic articles, the Journal will also include a chronicle of current events of the Anglo-Belarusian Society, as well as sections reviewing books and Internet resources. The revived Journal of Belarusian Studies is a joint initiative of Anglo-Belarusian Society and the Centre for Transition Studies, an independent think tank with analysts based in London and Minsk. Dr Kryvoi explained that the two most important challenges included finding a team of dedicated people and funding. Although the idea to put out the journal was already established in 2011, raising money and putting together an editorial team, translators and designers took a while. Attracting high quality academics required not only management skills but also relying on personal connections and the reputation of the Journal which it had developed since 1965. The renewed Journal represents a truly international and interdisciplinary publication. It features articles from the social science and humanities disciplines ranging from literature and history to political science. In the new issue, Journal's editorial is followed by an article of Dr Andrej Kotljarchuk from Stockholm who deals with memory politics in Belarus and how Belarusian authorities are using it to achieve their own ends. He presents and interprets contemporary trends in memory politics of the authorities. In particular, through the way the state commemorations of the World War II tragedies such the Holocaust, genocide of the Roma people and mass killings of the representatives of the Polish minority. President of the North American Association of Belarusian Studies Professor David Marples looks at foreign policy of Belarus towards the West and Russia. He examined relations between Brussels and Minsk between 2006 until the 2010 presidential elections. The author sheds light upon the reaction of the European Union to the aftermath of the elections and the effect of sanctions imposed on Belarusian authorities. Natalia Sliz, a scholar from Hrodna, describes the rules of noblewomen's dowry within the legal system in the 16th and 17th centuries Grand Duchy of Lithuania. Many consider the period of the Grand Duchy of Lithuania as the golden age of Belarusian history. The Belarusian element was particularly prominent during the Grand Duchy of Lithuania. The core of its territory occupied by what is today Belarus, the language was old Belarusian and it had a slavic population constituted the majority of population. Professor Emeritus Arnold McMillin’s of University College London wrote on the poetry of Belarusian prisoners serving their sentences for political crimes under Russian, Polish, Soviet and today's rulers. Father Alexander Nadson prepared a bibliography of the assets Francis Skaryna Belarusian Library which deal with proclamation of the Belarusian People’s Republic in 1918. Readers and libraries can order hard copies of the Journal online. 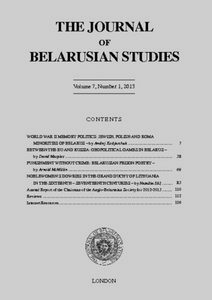 Since the main idea is to popularise Belarusian studies for a wide English-language readership, the archive of all issues of the Journal, including the most recent issue are available free of charge at belarusjournal.com. The editorial board has already opened a call for papers for the next issue. Submissions are accepted on a rolling basis and the final deadline is ­­31 August 2013. Paula Borowska is currently completing a PhD on religion and social capital at University College London. She holds a Master of Arts degree in Interdisciplinary Research and Studies on Eastern Europe from the University of Bologna.